Spring is here officially, although the in some places you may question it. With spring’s arrival we felt that we’d share some Spring driving dangers and advice to food truck owners who are getting ready to launch and provide a reminder to those of you who’ve spent a few seasons in your truck. With winter fading into the background and better weather on the horizon, you’d think the roads would finally be safe again. This isn’t always the case. Today we’ll cover some of the road dangers to avoid as well as a few driving tips to help you and your truck make it safely to summer. Spring rain brings slippery road conditions and flooding. What makes rain and wet pavement so dangerous? For one, slippery roads reduce your truck’s handling and increase the distance it takes to stop your already tough to stop food truck. Big puddles can also cut down on tire traction and could lead to hydroplaning. Beware of hail storms, particularly if you live in a hail-belt state (Colorado, Kansas, and Missouri). Even small hailstones can shatter your food truck’s windshield, and raining balls of ice are never good for the roads or your truck’s exterior. We understand a truck won’t intentionally head out in a hail storm, (how many customers do you expect to wait in line while being pelted with hail? ), but if it starts hailing during a shift, have a plan in place to be able to get your truck under cover as soon as possible. Spring brings cyclists out of hibernation. Driving alongside cyclists can make traffic maneuvers, from turning right to parallel parking, more dangerous. Check your lights. Since spring rain hinders driving visibility, make sure all your lights work, including headlights, taillights, backup lights, turn signals, parking lights, and brake lights. Replace your wiper blades. Worn-out wiper blades may not be up to the task of clearing water away from your windshield. Check your wiper blades and replace them if necessary. Slow down and drive carefully. The first few rainy days of spring can produce exceptionally slippery roads due to oil and other leaked fluids mixing with rainwater, so slow down and increase your stopping distance when it’s raining. Look for danger spots. Keep your eyes on the road for bad road conditions. Remember that harsh winter weather breeds potholes and other driving obstacles. Seasonal showers and poor road conditions can create unpleasant complications for all drivers on the road. 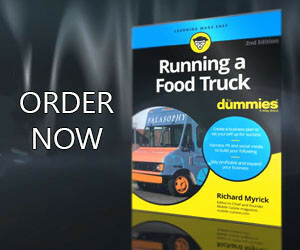 Food truck owners need to be a little more cautious due to the size and weight of your vehicles, not to mention that if your truck is damaged and cannot drive…you’re losing sales opportunities. Use the above tips to your advantage and you’ll be that much more prepared for any spring driving dangers that come your food truck’s way.